Microsoft has been working on their new Skype Translator tool that will translate voice in real time, and now the company has released a preview of the software. This new translation software is available to people who signed up to the service and who are using Windows 8.1 on their desktop computer or device, the program has launched with support for two languages, Spanish and English. 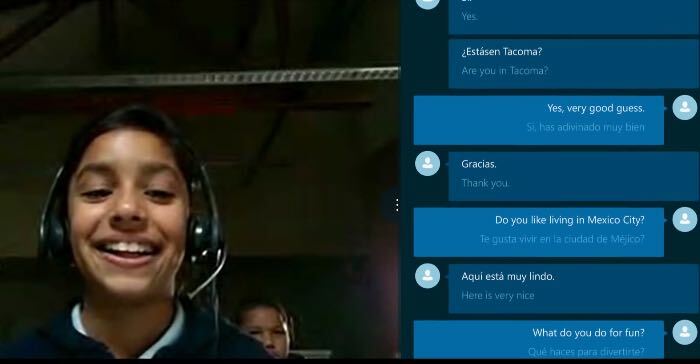 Microsoft tested out the translator service with school children at Peterson School in Mexico and Stafford Elementary School in Tacoma, USA. The children spoke to each other in different languages, and then the Skype Translator translated what they said into Spanish and English, have a look at the video below. As you can see from the video, this new language translation from Skype appears to work very well, and the conversations between the children in different languages were translated into their language in real time. Skype Translator relies on machine learning, which means that the more the technology is used, the smarter it gets. We are starting with English and Spanish, and as more people use the Skype Translator preview with these languages, the quality will continually improve. We also need your help to expedite new language releases. The company is looking for more people to sign up to the preview of the translator, and Microsoft plans to support more languages in the future, you can find out more information at the link below.